I honestly didn’t know we were doing the cover reveal so quickly, or I would have warned you all. Instead, let’s call it s surprise. 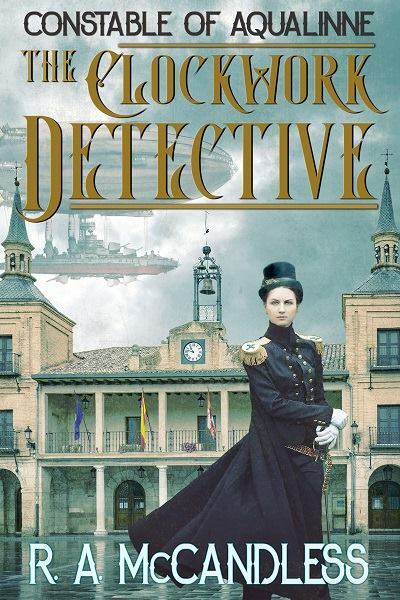 THE CLOCKWORK DETECTIVE by R.A. McCandless is a page-turning steampunk novel coming soon. It will be available at all the usual online outlets. Stay tuned for more info! Aubrey Hartman left the Imperial battlefields with a pocketful of medals, a fearsome reputation, and a clockwork leg. The Imperium diverts her trip home to investigate the murder of a young druwyd in a strange town. She is ordered to not only find the killer but prevent a full-scale war with the dreaded Fae. The arrival of a sinister Secret Policeman threatens to dig up Aubrey’s own secrets that could ruin her career. It soon becomes clear that Aubrey has powerful enemies with plans to stop her before she gets started. Determined to solve the mystery, Aubrey must dodge centaurs, local thugs and a monster of pure destruction. What do you think of the cover? Tell me in the comments below! The Return of Hell Becomes Her!